Our triceps don’t receive nearly as much attention as their more glamorous sibling, the biceps, yet they’re a majorly important muscle group. Besides helping us with everyday movements (they’re actually three muscles that help straighten out the elbow), toned triceps give the back of our arms that toned, sleek look (no bat wings here). Here are some of our favourite moves to target and tone the triceps. Some of these exercises require either bodyweight, resistance bands, a barbell or dumbbells, but the workouts can also be adapted for other pieces of equipment or weights that are comfortable. This is a slightly different version of the regular triceps extension and offers a new variation of resistance. The workout position starts standing with legs slightly wider than shoulder width apart. Holding a dumbbell with both hands, raise the dumbbell above your head and lower to the base of your neck. Raise it up, and that’s one rep. Aim for a total of three sets of 12 reps. Add some pulses at the bottom of the movement for extra resistance. It may sound like the title of a B-grade horror flick, but this is an effective workout for toning your arms and triceps in particular. 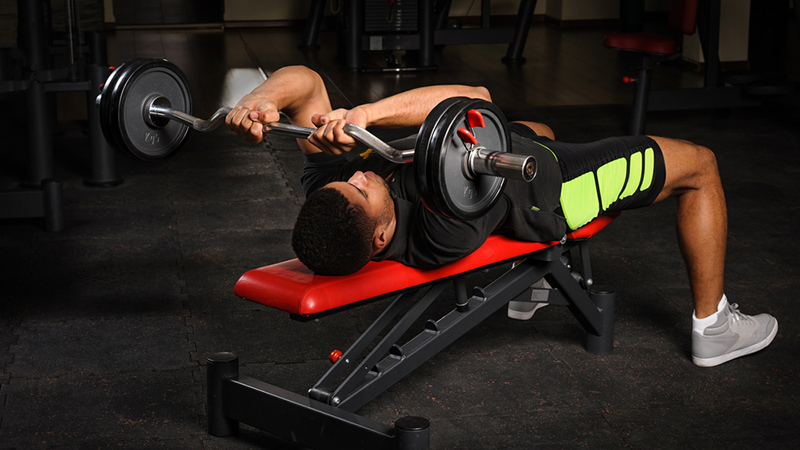 Begin lying on a bench on your back holding a barbell in an overhead grip, slightly closer together than shoulder-width. Keep your knuckles facing the ceiling. Slowly lower the dumbbell towards your skull until it passes your head slightly (do not extend too far, and do not hit yourself in the head!). Return to the starting position for one rep and aim for three sets of 15 reps each. Triceps extensions, or kickbacks as they’re otherwise known, can either be done from a starting position on all fours or with one arm and a knee placed on a bench with the other foot firmly planted on the floor and the other arm gripping a dumbbell. Whichever way you choose, the basic motions are the same. Pull the arm holding the dumbbell close to your rib cage, ensuring your elbow is bent. Slowly straighten out your elbow with the dumbbell extended toward your hip. Return to the starting position to complete a single rep. Aim for three sets of 12 reps.
Repeat the workout for the other side. Triceps dips can be done with a variety of equipment to add a little more challenge to the workout. Beginners can use a chair/bench or the stairs. I prefer to use the handles of my treadmill as I can suspend my body and use my full weight for a better workout. Sit at the edge of the chair/bench and with your arms supporting your weight on the chair/bench behind you, slowly walk your feet as far forward as you find comfortable. By bending your elbows, slowly lower your weight towards the floor until your elbows are at a 90-degree angle to your torso. Push your bodyweight back up to the starting position by extending your arms for a single rep. Aim for three sets of 12 reps each. This exercise will require the use of either a resistance band or a dumbbell. Start off by anchoring the resistance band under your forward foot, which should be bent at the knee while the back leg is extended backward. Hold the handle of the resistance band while leaning forward slightly. Pull the band backwards towards your hip while keeping your arm straight and return to the start for one rep. Aim for three sets of 15 reps.
Switch to the other side and repeat the routine. Here’s a push-up variation that has been successfully modified to hit the triceps. Start in a push-up position, but position your hands closer towards your torso, so your hands point towards each other in a “diamond” or triangle position. Lower your chest to the ground, keeping your arms grazing your torso. Your elbows should be going straight back. Push your upper body back up for one rep. Aim for three sets of 12 reps.